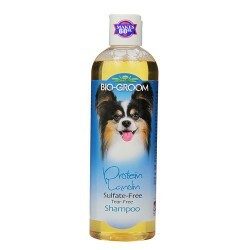 Product Information-Bio-Groom Protein Lanolin Moisturising ShampooThis unique formula is the original sulfate-free shampoo that will highlight all colors and make the coat shine! With a baby-mild, coconut oil base, it will thoroughly clean without stripping natural oils from skin and coat. Prevents dryness, rinses out fast leaving no irritating residue. Hair dries smooth, manageable, and tangle-free. pH balanced and biodegradable. Safe for puppies and kittens. Naturally Thin.Safe to Use with Topical Flea and Tick Treatments. Recommended by Top Breeders and Professional Groomers Worldwide.